One special moment of many in the Holy Land. 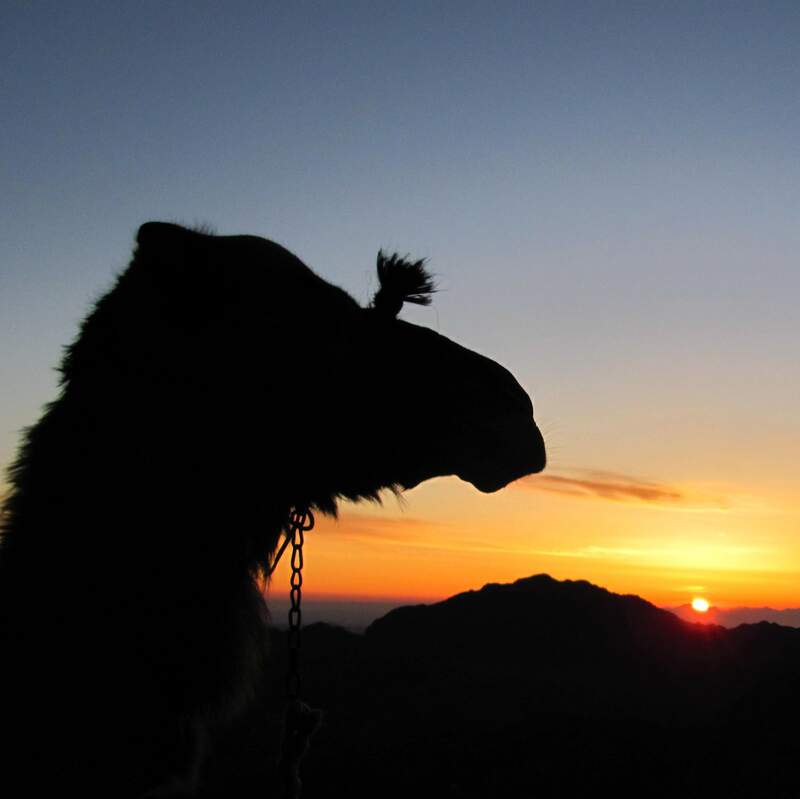 My camel plods steadily up Mount Sinai in the dark. Her cushioned feet make a soft crunch on the ground as she steps deliberately up the path, one large foot at a time. I am bundled in a warm fleece jacket against the crisp cold, sitting high up in my comfortable saddle. Holding securely to the worn, wooden pummel, I am accompanied by my moon shadow, riding up the mountain with me. My shadow and I are both sitting tall and easy in the saddle, breathing deeply the cold, fresh air. A slight odour of musty camel and camel dung drifts past on the light breeze. Overhead, the stars shine like brilliant jewels in the clear, dry night sky. I hear the guttural grunts and grumbles of the camels, and the calls of the camel drivers behind me. A radio blares for a while, then is silenced. I feel alone with my camel on this dark, rocky mountain. The camel takes a small mis-step and slips a little on the loose stones. I peer down a dark, steep precipice, but I am calm and trust my camel completely. I continue to feel the rhythm of her steady steps up, up, up the mountain. Imperceptively the black sky lightens and I can see into the dark crevasses. Somewhere a bird sings a pure, simple two-note song. The grace that has brought me here, to this place, to open my heart to God, brings me to tears. And my heart overflows as God pours in all that I need to sustain me on my journey: life and beauty, joy and love, awe and wonder, gratitude and peace, courage and strength. An hour later, we arrive at the summit at dawn. Suddenly the camel pitches back and forth, settling down onto her calloused joints to allow me to dismount. A little unsteady on the solid ground, I take a moment to find my land legs. Soon I am back to solid reality, two feet on the rocks, my heart singing as I watch the sun rise, knowing that I will carry home the strength of this mountain of God. I get so busy that sometimes I just need to stop everything and listen in silence. And he did not find God in the wind, nor in the earthquake, nor in the fire, but in the “sound of sheer silence.” In that silence God gave him renewed hope, and new tasks. 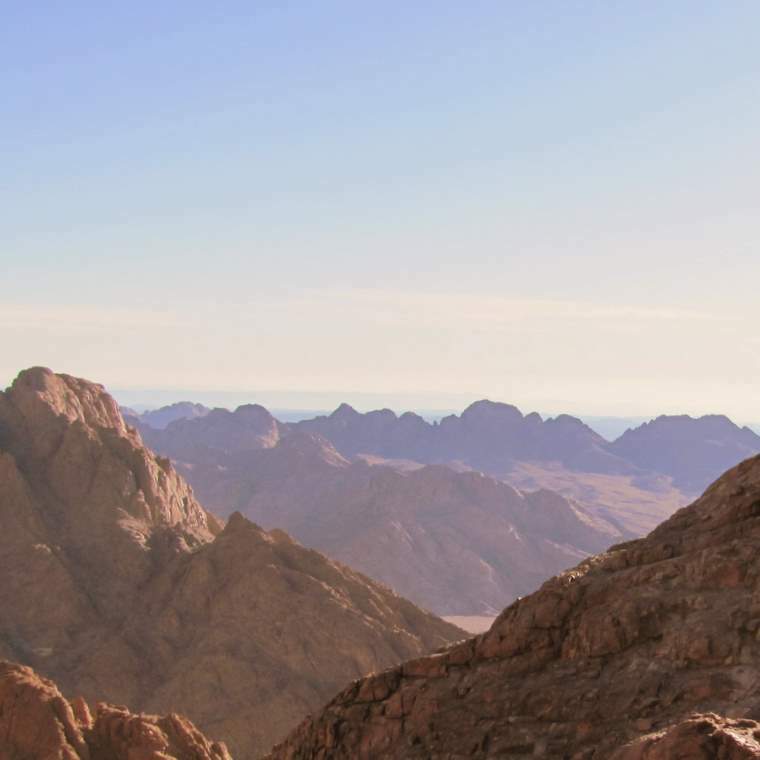 This is the view from Elijah’s Plateau on Mount Sinai where I had a chance to sit in silence for an hour and listen. Luckily I don’t have Elijah’s problems.